Energy System Services, Ltd. (“ESS”) is a leading remanufacturer of low and medium voltage electrical power distribution equipment and parts for critical applications as well as provider of preventative maintenance services. MelCap Partners acted as the sell side advisor to Energy System Services. ESS was sold to RESA Power Solutions, a strategic buyer located in San Jose, California. 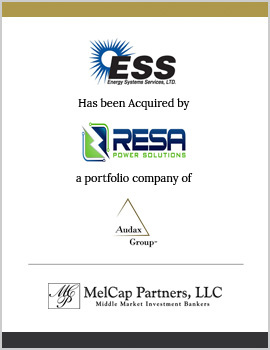 RESA is a portfolio company of Audax Group, a Boston-based private equity group.